From April 5 to 8, 2018, Art Paris Art Fair will bring together 140 galleries from some twenty different countries at the Grand Palais. Diversity and discove ry are the key words of this leading Springtime event for modern and contemporary art in Paris that combines a region-by-region exploration of European art from the post-war years to the present day and a cosmopolitan perspective on emerging creativity from around the world. 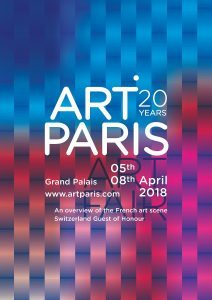 In 2018, Art Paris Art Fair will be celebrating its 20th anniversary. True to its original vocation to support the French art scene, the fair will be juxtaposing the subjective, historical and critical perspective of an exhibition curator, with a selection of specific projects focussing on artists in France who, both in the past and today, have managed to preserve their independence from dominant trends, or were situated on the margin of mainstream art history. These projects, submitted by participating galleries, may include a monographic presentation, a duo of artists, or a themed exhibition and will be highlighted in the fair’s communication. Guest curator: François Piron, art critic and exhibition curator.